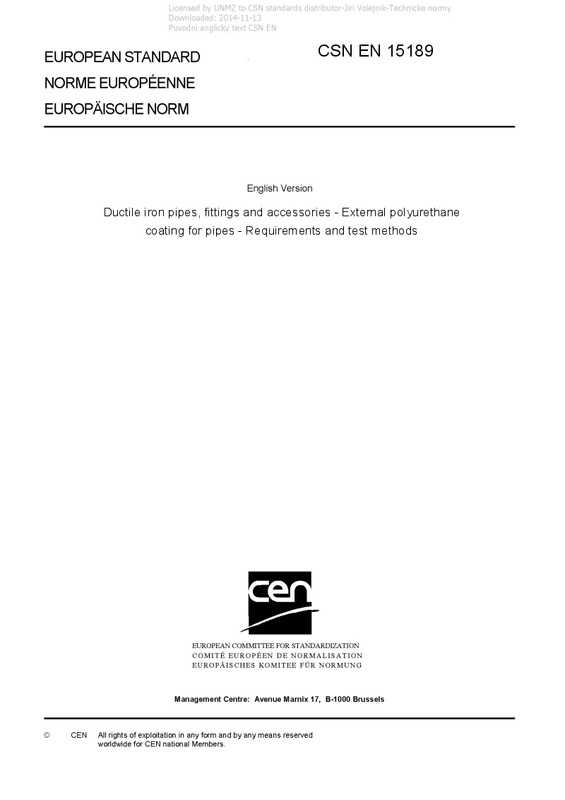 EN 15189 Ductile iron pipes, fittings and accessories - External polyurethane coating for pipes - Requirements and test methods - This European standard defines the requirements and test methods applicable to factory applied external polyurethane based coatings for heavy duty (Annex D.3 of EN 545:2002) corrosion protection of buried ductile iron pipes conforming to EN 545, EN 598 and EN 969 for use at operating temperatures up to 50 °C. This standard does not cover ductile iron pipes protected with zinc with a finishing layer of polyurethane. This standard does not cover special activities on site such as tapping, clamping, etc., which could affect the corrosion protection properties of the polyurethane coating. These operations should be covered in the laying instructions supplied by manufacturers of clamps, house connection saddles, etc. and any relevant user procedures.